The Deutsche Telekom cloud is growing. 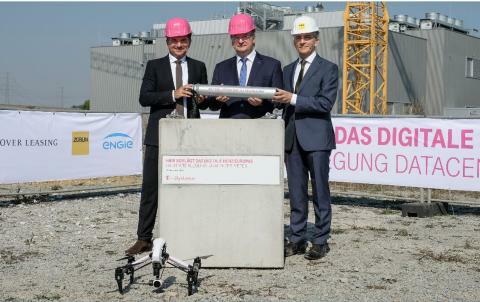 Currently around 600 major clients use the cloud services of T-Systems located at the twin data centres in Biere and Magdeburg that were completed under pilot contractor Ed. 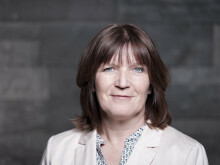 Züblin AG in 2014. Now a new foundation stone was laid on 12 September 2016: this time for the expansion of the data centre in Biere to increase cloud capacities by 150 %. With the laying of the foundation stone, the construction of the second section of the Dynamic Data Center for T-Systems is entering the hot phase. The joint venture DDC Biere BA 2, consisting of Ed. 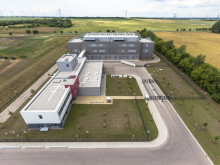 Züblin AG and ENGIE Deutschland GmbH (previously Cofely Deutschland GmbH), will expand the Dynamic Data Center on behalf of client and tenant T-Systems International GmbH through three additional modules (Cluster 2) and one office building. A bridge and various utility lines will connect the new Cluster 2 with the existing buildings. A retaining wall will secure the higher-lying ground of Cluster 2 versus the existing buildings and will allow the campus to be further extended in the future if needed. 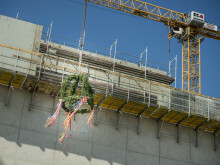 The ZÜBLIN entities involved in this second construction section are the business units in Sachsen and in Brandenburg/Sachsen-Anhalt. Earthworks began in June 2016 and the excavation of 58,000 m³ of earth is nearly completed. Overall, construction is scheduled to last 20-1/2 months, to be followed by three months of load testing conducted by T-Systems. The new buildings are scheduled for inauguration in the second quarter of 2018. Until then, approx. 21,000 m³ of reinforced concrete and 2,200 m³ of masonry must be erected. The building shell should be completed in May 2017. Parallel to the construction of the shell, starting in January 2017, Züblin will begin handing over completed sections of the building to the joint venture partners for the installation of the necessary technical equipment. 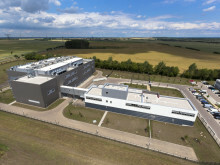 The project was planned and simulated in 3D already during the design stage in order to ensure the smooth construction of the expanded data centre. After all, the project involves the construction of approx. 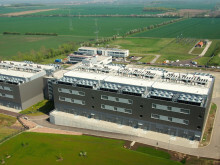 5,400 m² of computer space including the necessary electronic and climate technology, such as 18 UPS and emergency diesel generators as well as nine chillers with their distribution networks. 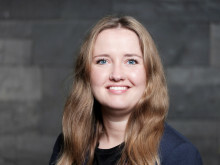 The project is also of pioneering importance in terms of sustainability. Like the first section that began operations in 2014, Cluster 2 has also been submitted for LEED Gold Standard certification from the U.S. Green Building Council. With a PUE (Power Usage Effectiveness) value below 1.3, the new data centre in Biere is one of the most energy-efficient centres in its class.